how to find the midpoint given two endpoints. how to find one endpoint given the midpoint and another endpoint. how to proof the midpoint formula. We have included a midpoint calculator at the end of this lesson. Some coordinate geometry questions may require you to find the midpoint of line segments in the coordinate plane. To find a point that is halfway between two given points, get the average of the x-values and the average of the y-values. The following diagram shows the midpoints formula for the two points (x1,y1) and (x2,y2). 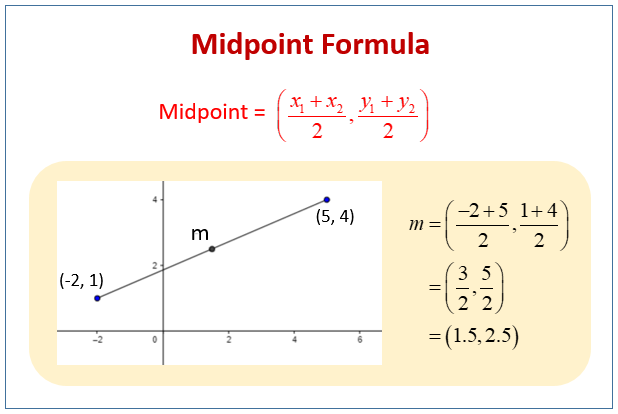 Scroll down the page for more examples and solutions on how to use the midpoint formula. We can use the midpoint formula to find the midpoint when given two endpoints. Find the midpoint of the two points A(1, -3) and B(4, 5). Worksheet 1, Worksheet 2 to calculate the midpoint. How to use the formula for finding the midpoint of two points? Find the midpoint of the two points (5, 8) and (-5, -6). How to use the midpoint formula given coordinates in fractions? Determine the midpoint of the two points (2/3, 1/4) and (11/6, 7/9). We can use the midpoint formula to find an endpoint when given a midpoint and another endpoint. M(3, 8) is the midpoint of the line AB. A has the coordinates (-2, 3), Find the coordinates of B. How to find a missing endpoint when given the midpoint and another endpoint? In the standard xy-coordinate plane, point M with coordinates (5,4) is the midpoint of AB, and B has coordinates (7, 3). What are the coordinates of A? How to solve problems using the Midpoint Formula? For a line segment DE, one endpoint is D(6, 5) and the midpoint M(4, 2). Find the coordinates of the other endpoint, E.
How to derive the midpoint formula by finding the midpoint of a line segment? How to use the Pythagorean theorem to prove the midpoint formula? The following video gives a proof of the midpoint formula using the Pythagorean Theorem. Step 1: Use the distance formula to show the midpoint creates two congruent segments. Step 2: Use the slope formula to show that the coordinate of the midpoint is located on the line segment. Enter the coordinates of two points and the midpoint calculator will give the midpoint of the two points. Use this to check your answers.